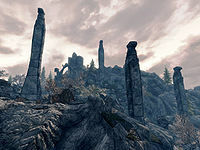 They are found at the top of a series of stone staircases and winding paths, interspersed with landings inhabited by Forsworn camped at Red Eagle Redoubt. The entrance is a level-locked iron door. That can be unlocked with the Red Eagle Tower key carried by the Forsworn Briarheart for Red Eagle Redoubt who is located near the towers. Inside there is a copy of The Legend of Red Eagle and a random pair of gauntlets on a sideboard opposite. There are a flight of stairs up to the right leading to a doorway outside to a wooden ramp up to the next level where there is a raised wooden bridge on the right and a doorway to the left. Just inside on the right is a chain that lowers the bridge. At the back of the room behind a flight of wooden stairs is an urn, while the stairs lead up to another level with even more stairs up to the highest level, both of these levels are empty. Once you have lowered the wooden bridge you may cross to a second tower to the east. On the far side there is a doorway ahead and a wooden ramp down to the left. Through the door the room contains a novice-locked chest and a flight of wooden stairs leading up, with another flight above these leading to the top, against these are both empty. Descending via the ramp brings you to a doorway with a broken sideboard opposite holding a random potion of magicka and a random empty soul gem. There are also stairs leading down on the right as you enter. At the bottom there is a pile of rubble with a random potion among it and opposite, an iron door, with a bar on this side stopping entrance from the other side. This location cannot be independently cleared. It will only show up as such when the boss-level creatures in Red Eagle Redoubt have been killed, as the game considers these zones one unit for the purpose of calculating clears. Sundered Towers itself will never add to your count of cleared locations, and therefore does not contribute to the Delver achievement. The key might not be on the corpse of the Briarheart. ? This page was last modified on 12 February 2018, at 09:40.